Andrew graduated from the University of Bristol in 2014. He then worked in mixed and small animal practice in the southwest of England, followed by internships at a private referral centre in Hampshire and the Queen's Veterinary School Hospital, University of Cambridge. He has a keen interest in orthopaedics, as well as medical and surgical neurology. 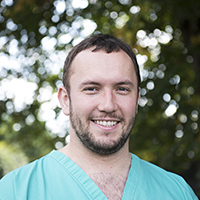 Andrew joined the Earlswood team in December 2017 and is currently studying towards the RCVS certificate in small animal surgery. His compassion, enthusiasm and wide-ranging knowledge make him a valued member of the team.